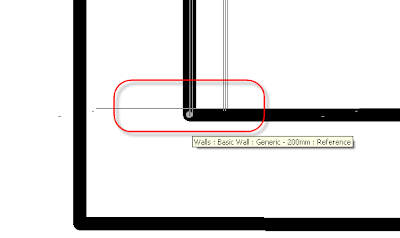 When working on existing building where wall faces are often not parallel how can dimensions be placed? 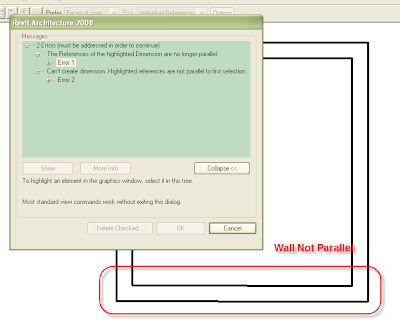 Revit errors occur when trying to dimension walls that are not parallel as follows “The References of the highlighted Dimension are no longer parallel” and “Can’t create dimension. Highlighted references are not parallel to first selection”. In this example the highlighted wall is less than 0.7 degrees, in other words is tilted and not parallel to wall above. To overcome this error, select Basics>Dimension>Aligned. 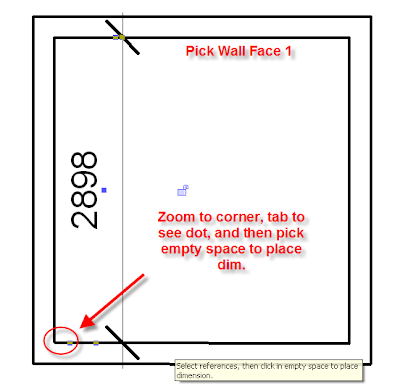 Pick first wall face that is orthogonal, then hover over second wall face and tab to cycle until you see a tiny dot in the corner of the wall then pick wall face. If you don't see the dot move your cursor closer to the wall intersection and tab again to see the dot. You can zoom in to do this. Zoom out and click in empty space to place the dimension. It is worth practicing this as it easy to miss this feature. Many thanks to Krisztian from Autodesk for this Revit solution.